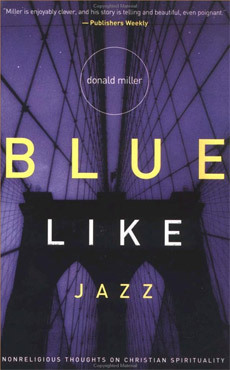 I had someone recommend this book to me, “Blue Like Jazz” by Donald Miller. That was my first time reading one of his books. I guess i can say it was interesting. My friend, who recommended the book to me said that it changed a part of his life. It didn’t do that for me, but i think it did it for my friend because my friend’s life is exactly how Donald Miller lives his. Ironically, those who relate to an author the most(People who are already exactly like the author), are the ones effected by his writings and are changed. Don’t know how that makes any sense, but i understand what they mean. Many people like the style of Donald Miller’s writings because Miller seems to admit out loud what most people are thinking in their head. Personally, i don’t think that quality is rare. I think many people are very open. I get this vibe that Donald Miller’s thoughts in his book Blue Like Jazz, are provoked exaggerations of what’s the reality is inside his head. I think his mind wanders, and what he writes really happens in his mind, but i don’t think his thoughts can be taken seriously. They are just wanders. For instance, i can sit here and think about how i would contemplate suicide but not actually be thinking about killing myself. I also get the vibe in Blue Like Jazz that Donald Miller likes indifference. Typically, that is not rare either considering 90% of people 25 and under are seeking an identity and seek something new, something unique, and maybe something rebellious. For instance, i came across his myspace page here. On that page his profile picture shows him with a cigarette in his mouth. Now, don’t get me wrong, my own mother smokes, and has been for the past 40 years, but let’s face the practicality of smoking versus the stewardship of one’s body. I’m not going to go in a rant that smoking’s bad for you, but i am going to tell you that your creator has plans for your full life, and depriving your life of its full capability is showing you are a careless steward. Anyways, i bring that all up because one of my pet peeves is being indifferent for the sake of indifference. Sure you can find 100 excuses to smoke in order to fit in with the sinners and witness to them, but i have never seen anyone say i want to gain 400 pounds either in order to fit in with the glutenous, or even for that matter, i want to dress like a nerd so i can fit in with them to witness to them. I don’t know why i’m going on this smoking rant, but i think i’m just gonna stick here for a while. You see the thing is with people like Donald Miller in Blue Like Jazz, is they love that people look at their smoking and see it as controversial. Its a selfish desire. Smoking is about them, and how Christians in general will judge them based on some rolled up leaves. Truthfully, the cigarette wouldn’t tell me at all that he’s a bad Christian, it just tells me that he’s a self absorbed human like the rest of us. I think we all have our own rolled up stogies in life. I don’t think i flaunt mine though? I don’t think flaunting our stogies is what God meant when he said that he would rather have you hot or cold. I admit my flaws, but i don’t want to flaunt them. Being open about your indifferences to the general Christian population may win you awards with certain people, but when has God called us to achieve satisfaction from people? Yeah, i know were suppose to serve, and be relevant, but Jesus didn’t compromise his holiness in order to live among men. You are free to disagree with me about smoking and nicotine, and habits, but i think there’s something that we can gather from what i said above. Most of us live our life of sin much like a cigarette. We have these sins and typically we like to roll them up and hide them in a nice neat paper sheet. Personally, i like to keep my cigarette’s in the pack, but many times in Blue Like Jazz, Donald Miller candidly wrote about whipping out the nicotine and smoking in front of everyone without any shame. Every Christian has had at one point say, “God, here’s my sins all rolled up”. What i’m trying to say is that we all have had to get them out in the open at one point, but i don’t think flaunting our burning cigarette of sins is a sweet smelling savor to God. I guess final note on Donald Miller’s book is i appreciate his candidness, and earnest heart, but being indifferent is much like paddling against the flow – you are just passing other people that have come from where you are going, and are thinking you are going somewhere new, just because you are traveling in the opposite direction. I admitted that i missed it already. I’m sorry that donald miller’s style of writing does not influence me like they influence you. Everybody’s different. Since i have ‘missed it’, would like to enlighten me on the concepts that you think i had missed. i would like to hear what you have to say.